Poonam Navnirman Sanstha is a women economic empowerment and child development organization which work to improve the lives of women and children in the society by giving them respectively, the right to work and the right to play. As many as 35 million children have hearing difficulties in India. They are isolated and neglected. Only 1 in 10 go to school and they are highly likely to end up living hand to mouth in unsafe situations. Hearing screeningpathway of care/support for those already in programmes. Training for D/deaf people to become employed coaches. Progression route for those demonstrating leadership potential. 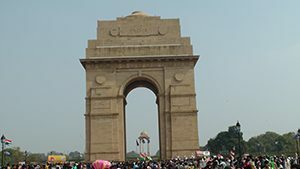 India Gate is a war memoral to the 70,000 Indian soldiers that died in the First World War. A group of NGO’s working with children across Delhi are now developing their Peace Field Project to commemorate the war dead and celebrate peace, through play. International Children’s Football Alliance stakeholders Slum Soccer has won the inaugural FIFA Diversity Award today. The award was created by FIFA to recognise outstanding organisations, group initiatives and football personalities that are standing up for diversity and inspire unity, solidarity and equality among all people. 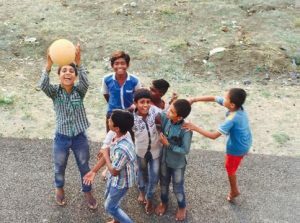 Slum Soccer uses football to connect individuals, teach life skills and work towards improving the living conditions of women and marginalised populations in Indian society. The other two finalists were the International Gay & Lesbian Football Association (IGLFA), which promotes and fosters the worldwide growth of football for lesbians, gays, bisexuals and transsexuals (LGBT) while also strengthening the self-respect of the global LGBT community, and Kick It Out, of England, an organisation which enables, facilitates and works with football authorities, professional clubs, players, fans and communities to tackle all forms of discrimination. The award was presented by FIFA Secretary General Fatma Samoura alongside former Dutch international Clarence Seedorf and former German international Thomas Hitzlsperger, members of the jury for the FIFA Diversity Award. The 11 members of the jury, including former football professionals and experts, have a wealth of global experience in various areas of diversity and anti-discrimination, whether related to ethnic, national or social origin, gender, disability, language, religion, political opinion, sexual orientation or any other form of discrimination. 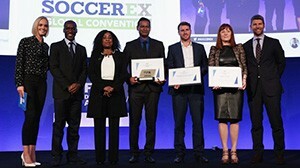 The ceremony, which was held at the Soccerex Global Convention in Manchester, UK, and was hosted by CNN anchor Amanda Davies, provided the occasion for a lively discussion on diversity in sport. 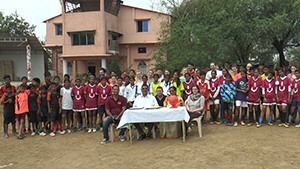 The First International Children’s Football Alliance (ICFA), Peace Pitch, Nagpur, India. Slum Soccer celebrated the twinning their Academy football pitch with Flanders Peace Field and The Peace Village, Messine, Belgium, site of the 1914 First World War Christmas Truces. The Peace Field plaque (sponsored by Jones Lang Lasalle, JLL) was presented to Vi’jay Barse the founder of Slum Soccer by Ernie Brennan, Managing Director of the National Children’s Football Alliance. ‘It was an honor to take part in the twinning ceremony. We are here to observe how non government organisations work in the third sector. Observing how the National Children’s Football Alliance (NCFA) UK work together with Slum Soccer has been a fascinating and inspiring experience which all my students will benefit from’. Prof. Dr. Alexandra Caspari. 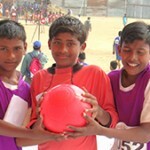 ‘This is a very important part of Slum Soccer to have a peace pitch that promotes play to young and old people. The connection with the First World War’s, 1914, Christmas Truces and India, is a valuable historical and modern day learning tool. We will promote peace through play and continue to work with our partners to ensure all children benefit from football’. Dr Vi’jay Barse, Slum Soccer. Dr Vi’Jay Barse signs the Peace Field Declaration. ‘This is a great idea and I think all the Slum Soccer players, coaches and parents, will understand that we coach football to everyone but we also teach good values that promote peace’. Homkant Surandase, Slum Soccer, Head Coach. 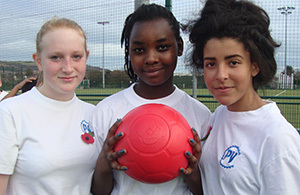 There is a lot to gain from twinning a football pitch with Flanders Peace Field. The universal message of peace lends itself to sportsmanship, equality, humanitarianism and citizenship. 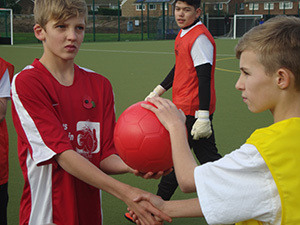 Coaches use the 1914 Christmas Truces’ football match as a valuable learning tool in terms of community cohesion. Slum Soccer will use the Peace Pitch to bring people together. The educational aspect of the Peace Pitch draws on a cross-curricular programme incorporating history, literature, cultural diversity and peace making. It is hoped that the Peace Pitch will facilitate all-inclusive peace tournaments and bring together further funding opportunities for local, regional and National companies to help support the good work of Slum Soccer and all their children. The International Children’s Football Alliance will be working with Slum Soccer in February / March, 2016, on a number of initiatives to help enrich Slum Soccer football coaches and Slum Soccer children. Workshops will take place in Chennai covering aspects of family football, special needs football, girls and boys playing football together. The Children’s Football Alliance tour then goes to Nagpur where the Peace Fields Project will twin a Slum Soccer Field of play with Flanders Peace Field, Messines, Belgium, site of the First World War Christmas Trues. 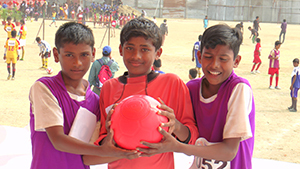 Slum Soccer, India’s Children’s Football Alliance will facilitate the first Peace Fields Football events in 2016, their designated areas of play will be twinned with Flanders Peace Field, site of World War One, 1916, Christmas Truces, where the famous football games were recorded by allies and German soldiers. The Slum Soccer film produced by the NCFA highlights the importance of the organisations’ work in some of the poorest places in India. 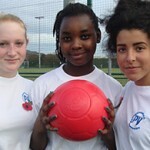 Children with the Peace Field Poppy Ball the One World Play Project Football that commemorates Flanders Peace Field. One World Play Project recognise that Play is in our DNA—a need as important as food, medicine and shelter. It’s an intrinsic part of our lives, regardless of geography or culture, and through play we become stronger individuals, build better communities and create a more positive future. ‘The Underdogs’ galvanised a sense of togetherness like no-other emotion. 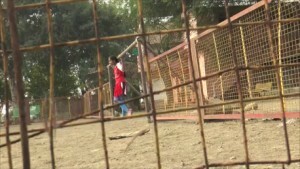 This story of an International Children’s Football Alliance team representing Slum Soccer, India, is an inspirational story. Some of the team that experienced the Swiss International u16s 2015 tournament talk about when they played against academies from professional European clubs. Bringing a team of young players together from one of the poorest slums in the world to one of the most beautiful, affluent and serene countries in the world, was an experience never to be forgotten. ‘I learnt so much as a football coach at the Swizz under 16s 2015 International Cup Tournament. I felt young players from India may not have the best facilities or the best leagues in the world but what they do have is the passion and desire to play at all levels’ Humkant Surandase, Slum Soccer, Head Coach. 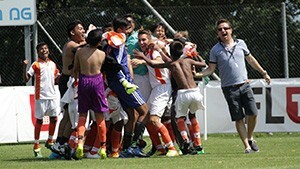 This was a unique social inclusion programme as witnessed in the Slum Soccer u16s Tournament in Switzerland Evaluation produced by the NCFA. Eleven Indian players formed a squad with eleven local players from Liechtenstein and Switzerland to take part in the Football Is More, Swiss, u16s International Cup. None of the players had ever played together before. They were formed to play against a number of Europe’s professional clubs’ youth academies. The mish mash squad representing India played six matches and understandably considered to be the cannon fodder of the tournament. What transpired was a lesson to all that participated and all that witnessed the matches that India played. The score lines should have been predictable and to a degree they were. However, the Indian squad were arguably the most progressive team in the tournament. A fact that did not go unnoticed by the event organisers who voted the Indian goal keeper, the keeper of the tournament. The Indian goalkeeper had never played on such palatial surfaces in his life and yet he beat off academy goal keepers; some of whom had been in the football academy system for four or more years. Coaching and managing a brand new team where players from different cultures do not know each other’s abilities may sound daunting in a tournament environment. The challenge was to form a close bond on and off the field in a short space of time – 5 days. This was achieved quickly in terms of short, sharp bursts of training. Under a blistering sun the Indian squad were soon a metaphoric goal up. Conserving energy and staying cool and calm was second nature to the Indian players and their foreign team mates quickly adopted the same tactics. While the clip board ‘prescriptive’ coaches of academy teams were training their players in 30 minute sessions right up to kick off, it became clear that the Indian team would benefit far more from having small progressive targets set for each match. The Indian team were told from the start that results were for the other teams to worry about and that they could expect that other teams’ managers would consider them as easy opposition. ‘We said to our players in the first match that your target is to keep the score at nil nil for the first 10 minutes and if that was successful we would seek to get three shots on goal’ Sajid Jamal, Manager. It transpired that small realistic targets in each game were not only achieved but built up a tremendous team spirit to the point where India won their final match in front of the largest audience of the tournament. Their match performances were acknowledged by other participants and their parents who sensed that the ‘underdogs’ were playing without the burden of fear and with positive adult expectations. ‘We manufacture footballers far too early. When our players came up against the Indian team they were suddenly confronted by unpredictable players full of energy, passion and desire. The Indian team lacked flare but their creativity was a sharp reminder that no matter how hard you coach a team at any level you will only witness creativity when you put down the coaching books. ‘The Indian team played a form of football that reminded all the academy teams not to stop playing street football because that is where you start your trade’. Jim Cassell, ex-,Manchester City Academy.